Cartsen Nebel has spent years in the Himalayas trekking and maintaining meticulous diaries. His site www.myhimalayas.com is a treasure trove of information for trekkers and mountain lovers alike! Well worth a visit! This is the site where Everest climbers, trekkers and mountaineers come for news! Daily news updates from different parts of the Himalaya! Please do visit Everest News ! 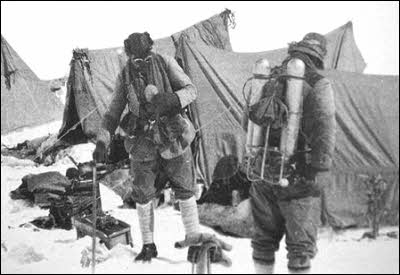 George Mallory and Andrew Irvine vanished on Everest in 1924 going strongly for the summit. Noel Odell who was the last to see the pair had said “I saw the whole summit ridge and final peak of Everest unveiled. I noticed far away on a snow slope leading up to what seemed to me to be the last step but one from the base of the final pyramid, a tiny object moving and approaching the rock step. A second object followed, and then the first climbed to the top of the step. As I stood intently watching this dramatic appearance, the scene became enveloped in cloud once more, and I could not actually be certain that I saw the second figure join the first.” Conrad Anker an experienced Everest climber found the body of Mallory in 1999. For an account of Mallory’s life as well as his Everest expeditions and “finding Mallory” please do visit this wikipedia link http://en.wikipedia.org/wiki/George_Mallory . The last chapter of Mallory and Irvine is well documented in this Everest News article by the climbers who went to search for them. For a detailed account of the search for Andrew Irvine please visit http://www.velocitypress.com/CopyIrvine.shtml by Tom Holzel.